The M500-384 USB Ultrasound Microphone enables you to make high-quality, full spectrum recordings of bat calls or other ultrasonic signals with a wide variety of computers/laptops/tablets/smartphones, using the sound recording software of your choice. The M500-384 uses standard sound device drivers and does not require installation of any custom drivers. Like the M500, the M500-384 comes in a slim and durable aluminium enclosure and utilizes the same advanced electret microphone technology as the well-known D500X detector. The M500-384 can be used both in directional and omni-directional modes. 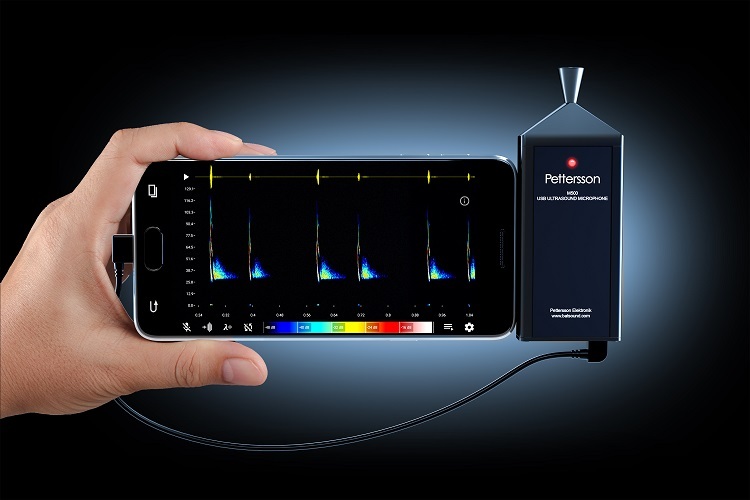 The M500-384 is the ideal choice if you intend to use your smartphone for ultrasound recording. Also consider this model if you need to be independent of a specific OS or software. The software you choose to use must support recording at 384 kHz. Works with Android, Linux (Ubuntu), OS X, iOS or Windows. Please verify the hardware compatibility of the software you choose and that it supports recording at 384 kHz. Certain tablets - particularly low-end devices - have been found not to support USB audio at 384 kHz. The picture below shows the M500-384 with an Android smartphone, running the Bat Recorder app, available at Google Play. The following list includes some programs that can be used with the M500-384.